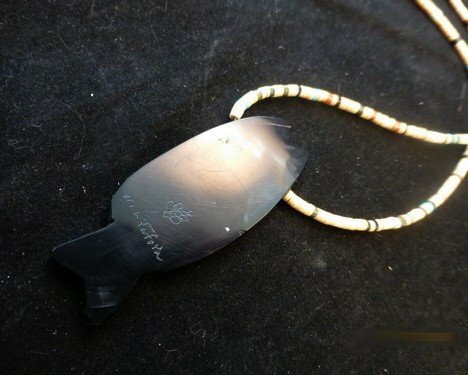 Unique one-of-a-kind folksy multigem inlay necklace handmade by Mary Tafoya. 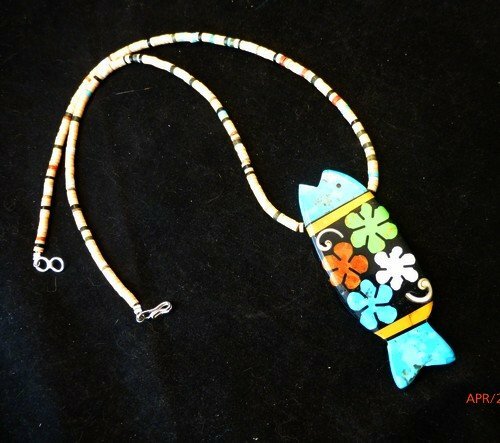 This hand made inlaid mosaic fish pendant is attached to a 21-inch muti-gem heishi necklace. 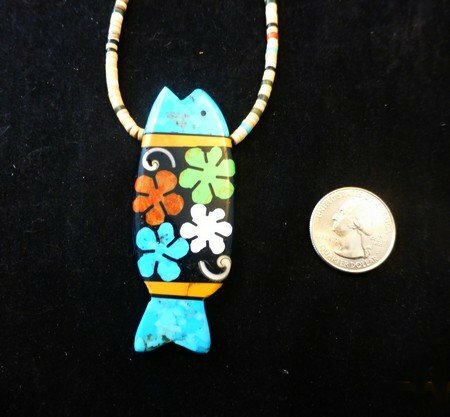 The centerpiece is a colorful fish inlaid with turquoise, apple coral, gaspeite, Mother of Pearl & more, measuring 2-3/4 inch long by 1 inch wide. Brand new and in perfect condition. Hallmarked by the artist. Certificate of Authenticity and gift box included with your purchase. Mary Tafoya learned her jewelry making techniques from her parents, by helping them string beads. 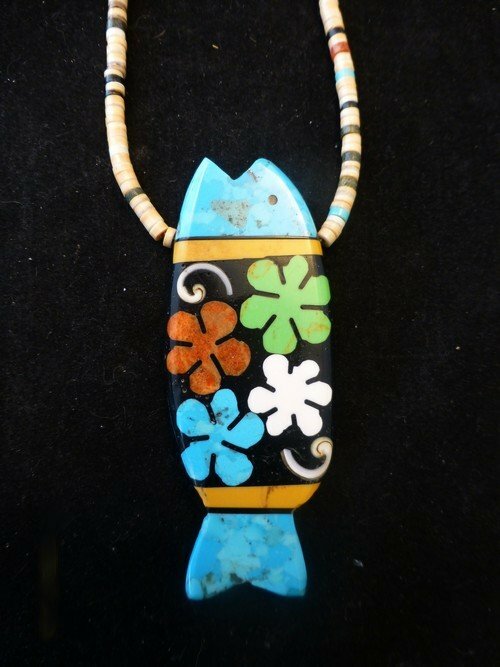 She says that the old style Thunderbird necklaces inlaid on battery casings or records, that were sold during the depression era along highways or on the plaza in Santa Fe were the inspiration for her work. Using natural stones, shells and turquoise, her designs are free form inlay where no two pieces are alike. Sometimes due to the detail of her work, people think her designs are painted, but they are in fact the natural colors of her materials that have been intricately inlaid. Her unique designs are extremely popular. I am a member in good standing of the Indian Arts and Crafts Association (IACA). As an IACA member, I promise to promote, preserve and protect authentic American Indian arts and crafts. This insures the authenticity of the jewelry I sell and protects your investment.